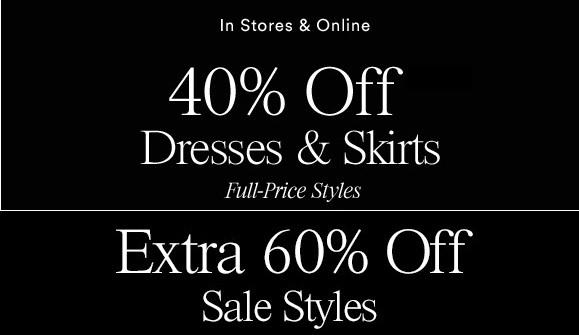 Get information about huge savings available at U.S. Ann Taylor Stores and online on Ann Taylor Official website. Get discounts on dresses and skirts + save even more on sale styles at Ann Taylor stores in the U.S. and Ann Taylor online. Take 40% off dresses and skirts. Valid on full priced styles. Plus, get an extra 60% discount on sale styles. Source of the information is Ann Taylor. Offer is valid until January 30, 2017. For more information about the offer visit your nearest Ann Taylor store location in the U.S. or Ann Taylor online.